MENDOCINO, CA — On Monday, September 15, 2014, in a crass marketing exercise, —shoddily enveloped in deniability— Urban Outfitters made available on their website, a sweatshirt, with a Kent State University insignia, appearing to be tattered and blood spattered. The launch of this item cut deep with many, triggering painful thoughts of contemporary school shootings, ugly reflections of the current state of police violence in communities, and worse yet, it seemed to relegate the memory of the Kent State University protestors who were brutally murdered by the national guard into a frame of hipster irony. Pushback was inevitable —a petition was quickly created, media was quick to indict UO on the move, and shortly thereafter the company issued a half-cocked apology. Perhaps the most disturbing moment in the exchange came on Tuesday September 16, 2014 when Urban Outfitters CEO Richard Hayne refused to speak to Laurel Krause, sister of slain Kent State University student Allison Krause, presumably because he was busy conjuring up this email to UO staff about how the sale was a mistake. “My sister Allison Krause was one of four students killed at Kent State University in May 1970 when United States military personnel opened fire on unarmed students protesting against the Vietnam War. I was 15 at the time and Allison was 19, the age range of many Urban Outfitters customers. “I was absolutely stunned and appalled to see what appeared to be a blood-splattered Kent State sweatshirt on sale at your online store this week. 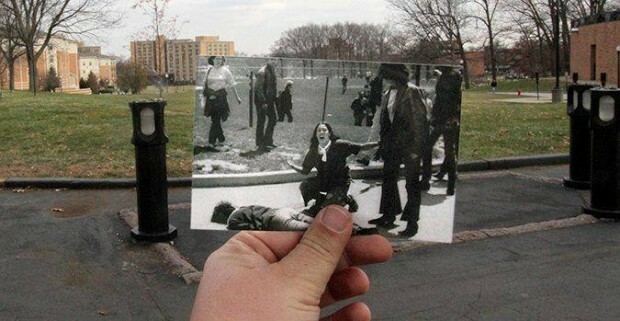 It brought back the horror of May 4, 1970 and the death of my sister, murdered in a Kent State campus parking lot on that day. “My family and I were deeply dismayed that no staff member at Urban Outfitters was able to recognize the insensitivity of selling this garment and we question the staffing decisions and product selections of a company meant to be at the forefront of youth culture in America. “We also feel that your official apology made light of the gravity of the incident. Urban Outfitters failed to recognize their responsibility in this matter. You put profit above people when you sought to make money with this horribly offensive garment and online marketing stunt. “We ask Urban Outfitters to make every effort to rectify our injury by acknowledging the true history and significance of the Kent State massacre, which lead to the largest campus protest and strike in US history. Urban Outfitters should turn this disturbing event into an opportunity to educate their customers and greater community about the Kent State Massacre and the lessons that can be learned from it. “The Kent State Truth Tribunal primarily focuses on education and spreading Kent State truth and justice. We strongly encourage Urban Outfitters to take a meaningful step in the right direction by returning our phone calls so that we may work together to rectify this insult and injury. Many Americans stand by us in our call for Urban Outfitters’ accountability. To arrange an interview with Laurel Krauss please contact Andy Stepanian via email at andy@sparrowmedia.net or by phone at 631.291.3010. Tagged Allison Krause, Kent State, Kent State Massacre, Laurel Krause, Richard Hayne, Urban Outfitters. [NEW YORK, NY] On the eve of the second anniversary of the Occupy movement, two video activists, have released a 10 minute short film providing perhaps the most detailed civilian account to date of the NYPD’s process of crowd dispersion during mass mobilizations. The video, shot on September 17th, 2012, during Occupy Wall Street’s first anniversary celebration action, details 10 arrests that took place over the span of 87 minutes. While at first glance many of the individual arrests appear to be arbitrary, careful analysis from the videographers illustrates a larger picture wherein the NYPD’s actions are calculated and designed to derail the protestors ability to effectively assemble. This video is a powerful resource for activists of all stripes in New York City. Please watch it, share it, carefully examine the NYPD’s process in it, and use it to inoculate yourself from their coordinated attempts to stifle your first amendment protections. ‘10 Arrests in 87-minutes’ was shot by Paul-Henri Sullivan and edited by him and his brother, Justin. Each were arrested while filming this video and each have had their charges since dismissed. Tagged #s17, crowd suppression, mobilizations, nypd, occupy wall street, ows, protest repression, taru, video. [NEW YORK, NY] George Martinez grabbed national headlines when he became the first Occupier to qualify as a major party primary candidate for the United States House of Representatives, but few know that the fledgling politician also has a seasoned career as a celebrated hip-hop emcee in New York City’s grassroots political hip-hop scene. Last week when Jay-Z was interviewed for a cover feature in the New York Times Style Magazine he indicted Occupy Wall Street as a directionless cloud of ideas. Local press was buzzing with how Occupy would respond, would they ignore it?, would they protest?, would Jay even care if they did? Hip-Hop media mogul Russell Simmons quickly seized this opportunity to open up a dialogue with Jay-Z surrounding money in politics. Simmon’s political director, Michael Skolnik quickly followed suit with his own thoughtful response, but in order to fully capture Occupy’s & Hip-Hop’s response to Jay-Z’s uninformed comments it would be best to have the response come from an Occupy Hip-Hop artist. First, I want to thank Jay Z for his recent public statements regarding the Occupy movement. I respect his honesty and I welcome this exchange as an end to the “Government For Sale” syndrome corrupting our democratic processes. Second, I want to thank Russell Simmons for his response to Jay in an attempt to educate and build solidarity. His response was a thorough and thoughtful summation of the macro issues that Occupy has raised over the last year. In particular, Russell helped to illustrate the connections between “the corrosive influence of money in politics and elections” and repressive policies like stop and frisk. Jay, I would prefer to build with you instead of slam you, and I know that you are already supporting a number issues that make up the cloud of “Occupy,” like… ending the war on drugs, supporting job creation and supporting the president on marriage equality. And let’s also be clear, I know progressives don’t want to plunk tens of thousands of dollars per plate on campaign fundraisers when they know that the money could be going to directly helping people and directly investing in the community. But because some have highjacked our democracy through Super PACs that spend limitless amounts of corporate cash in politics, hope and opportunity get stifled. This process has driven our country towards the brink of economic ruin. In response to this process a coalition of activists, artists and various segments of the community have taken on the challenge of getting money out of politics and putting the people back in charge of their democracy. To get the money out …and put the voters in! Our public and political institutions should not be allowed to operate under the same rules the govern regular commercial industries, since our constitution and our republic exist only through a social contract bound by the consent of its’ people. Thus “we the people” vest trust in our public institutions and must raise up when that trust is violated, or when special interests join to undermine the integrity of our public institutions, politicians and their elections. Imagine Jay, some people believe that corporations are people like you and me. They believe that these corporations have the same rights as people. Then, with a Supreme Court decision called, Citizens United v. F.E.C, the “Super PAC” was born allowing corporations to spend unlimited amounts of money to influence elections because of their individual rights to “free speech” just like you and me. I hope you would agree, that this is wrong. In fact, President Obama, has also said he supports exploring a Constitutional Amendment to overturn the “Citizens United” decision. For me, “Occupy” can be easily understood from a Hip Hop perspective. With Hip Hop we bum rushed school yards and sidewalks and transformed them into dance arenas for breakers. We didn’t ask James Brown or anyone if we could sample their records. We “borrowed” electricity from lamp posts to power our amps. We painted subway cars and inspired a global phenomenon that is literally saving lives around the world through the convergence of 5 elements: Dj, Rap, Aerosol Graffiti, B-boy, and Knowledge. What happened in Zuccotti Park was similar to the spirit of Hip Hop; in that an unauthorized assembly of like-minded and creative people, created a space for community building and organizing to directly address local community concerns. More importantly, “Occupy” took on the overarching barrier to addressing these concerns due to the corrupting power corporate money has on our democratic processes and institutions. Through this organic coalition, a framework was created to mobilize around the reality that “another world Is possible.” By creating this framework, a model was built that embraced a diverse set of strategies to encourage everyday people to find where they could fit into the movement to work towards the overarching goal of reclaiming our democracy and building opportunity. At the beginning of my involvement with OWS, I also observed that there was a “cloud of issues,” however, I quickly recognized many of them as issues that I and others in the Hip Hop community had been vocalizing and organizing around for years. Through keeping an open mind and participating in the democratic and community-building processes, I learned from others and was able to build support to identify specific strategies and actions to focus the movement on addressing issues that impact my immediate community. This included focusing on strategies to challenge the power of money and its’ corrupting influence on our democracy. We did this by building a grassroots movement and providing tools to empower the hood through a “Do-It-Yourself” (DIY), direct democracy engine that would facilitate community deliberation of important issues, implementation of community solutions and community resource management. Additionally, we inspired people to “Occupy” local political office. My personal “direct action” involved running for Congress by building a “Block by Block, and City by City” electoral direct action movement called Bum Rush The Vote (BRTV). The premise of BRTV is simple, build a people’s machine that can compete against the power of the corporate control over our democracy. Five months into the Occupy movement, I declared my candidacy, for New York’s newly redrawn 7th Congressional District. This included my home neighborhoods Red Hook and Sunset Park and your home neighborhood of Marcy Houses. Throughout the course of my campaign, I met with thousands of people on their neighborhood blocks, highlighting their stories in order to move the dialogue beyond the macro analysis of the issues to the real-time effects on our neighborhoods. One issue in particular, that Russell also highlighted, involves the relationship between money and the prison industrial complex which has particularly harsh repercussions in the hood. Studies document that there is a dollar for dollar relationship between dollars cut from public education and increased investment in the prison industrial complex. Furthermore, in New York, your home neighborhood of Marcy Houses falls in the police district with one of the highest rates of youth “stops and frisks,” all while local schools and youth programs are either failing or are being shut down. This is why I occupied, this why we are the 99%, and this is why we need the 100% who want to reclaim our democracy and our communities. I believe that the space of transformational hopefulness that is at the core of “Occupy” is available to everyone, and that we all have a part to play in finding solutions. I have committed my non-profit organization, the Global Block Foundation, to developing and distributing Bum Rush The Vote as our official political literacy initiative. I invite you to join us, or, in the spirit of “Occupy,” get in where you fit in. Working Together, Block by Block and City by City, Another World is Possible. All Day, All Week, Occupy All Streets! Tagged george martinez, global block, jay-z, occupy the hood, occupy wall street, ows, Russell Simmons. Long Island, NY — On July 8th, 2012 The Sparrow Project was honored to play a role in coordinating an action targeting a Romney 2012 Campaign fundraiser at the Southampton home of billionaire David Koch. This action was part of a non-partisan coalition effort with widespread support from both mainstream and grassroots groups who wished to challenge the pervasive role of Koch money on policy making. While Mitt Romney was scheduled to make four appearances at Southampton events on July 8th, the coalition made a conscious effort to not have protestors attend any events other than the fundraiser at David Koch’s home. This was done in an attempt to assure that the narrative would not become preoccupied with Mitt Romney but rather stay focused on money in politics, specifically money with strings attached to the petrochemical industry, the military industrial complex, and similar business interests that would place capital over compassion and profit over people. As part of the action’s media strategy a list of ten talking points related to the Koch brothers was printed up and handed out to those who attended. This talking point sheet stirred Koch Companies Public Sector President and COO Phillip Ellender into releasing an immediate response through their DC press office challenging each of our listed talking points and went further to single out Sparrow Project cofounder, Andy Stepanian as a “convicted terrorist” wholly responsible for the demonstration. 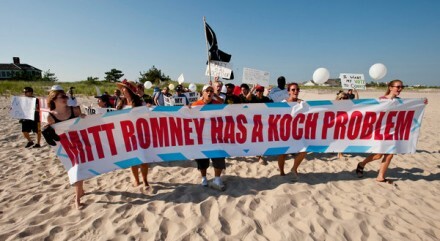 While only 200 people attended the July 8th action in Southampton, a focused media strategy, creative visuals, and even an airplane-pulled banner that read “Mitt Romney has a Koch Problem” made the action a complete success. In the week that followed the action, Sparrow tracked favorable news coverage from hundreds of national media outlets, including 7 separate write-ups in The New York Times. We would encourage you to read Natasha Lennard’s article for Salon, Michael Tracey’s coverage for Mother Jones or Jessica Yellin’s report for CNN, as these phenomenal pieces do a great job of communicating the action’s mission as well as the sentiments of those who participated. A semi-complete roundup of media coverage is also available HERE. While the response from Koch Industries Public Sector is rife with erroneous, self-serving, and often circuitous rebuttals, it is important to underscore that Andy Stepanian was but one of many individuals who played a role in organizing the July 8th action. We say this not to defer responsibility but rather to honor the hard work of countless activists and groups that made the action a success. Considering this success and the media attention that followed, Koch’s response is not entirely surprising. The email informed the Sparrow Project that Robert Tappan, Director of External Relations for Koch Companies Public Sector was engaging in an aggressive media blitz in which he was hounding editors at outlets that had already covered the action for their failure to report that Stepanian was in fact a “convicted terrorist.” Robert Tappan is best known as the Burson-Marsteller executive assigned to the Blackwater USA account in 2007. Tappan helped navigate the beleaguered mercenary group through a sea of negative press surrounding the massacre of innocent civilians in Iraq and is now being tapped by Koch Industries to combat the groundswell of negative attention Koch Companies and Koch-affiliated political action groups have been receiving. In a July 16th post on the Koch Industries website titled “Evading Responsibility at the New York Times” what appears to be the entirety of an email exchange between Robert Tappan and New York Times Managing Editor, Dean Baquet was posted. The 5 email exchange which took place from July 9th to July 15th reads like a broken record and speaks volumes to Mr. Tappan’s desperation, as he obsesses over the demonstrations attendance and the failure of the Times to label Stepanian as “a terrorist.” The exchange can be read HERE. The efforts of Robert Tappan and Phillip Ellender resulted in very little negative coverage of the activists’ action. Of the journalists we spoke to who received emails from Tappan all said that they paid little attention to their efforts. What is alarming however, is the ever-growing use of the word “terrorist” by industry groups to marginalize activists and political organizers to whom they disagree with or who pose a threat to their profits. This trend, if left unchecked, can sow seeds that quickly grow into accepted notions that activists are somehow “criminal” or “terrorist.” It is for these reasons that we are calling shenanigans on the Koch brothers, and have posted a detailed dissection and counter-response to their published media statements. We have also included a short list of known donors who attended the party at David Koch’s Southampton home. Sections in the below reply with a [Koch] prefix came from Koch Companies Public Sector’s Press Office. Sections with a [Sparrow] prefix should be attributed to The Sparrow Project. Andy Stepanian, cofounder of The Sparrow Project along with Will Potter author of Green Is the New Red contributed to this counter response. We welcome Robert Tappan, Phillip Ellender, Charles or David Koch to make another desperate attempt to find error in our counter-responses below. We have seen media reports about the protest being organized by a convicted terrorist and a number of fringe organizations. It is ironic that the pretext for the protest is supposed “outrage” at the role of money in politics. Considering the record-setting fundraising by President Obama as reported here, here, here, here, here and here, the hypocrisy of the Left and their attempts to mislead the public are obvious. There is a double standard at work here, and the message from the Left is that fundraising for their preferred candidates is fine, but donations to those with differing points of view are somehow immoral. The Left’s outrage is selective and hollow. [KOCH] PolitFact Wisconsin debunked this charge weeks ago when it was first made by Democratic operatives. Koch supports Gov. Walker’s reforms and so do a solid majority Wisconsin voters as evidenced by the results of the state’s most recent election. We respect their choice. Additionally, AFP is not David Koch’s “group.” Americans for Prosperity has more than 1,800,000 activists in all 50 states and 34 state chapters and affiliates. More than 90,000 Americans in all 50 states have made a financial contribution to AFP or AFP Foundation. This sounds like broad-based support to us. [SPARROW] American’s for Prosperity (AFP) went on record as spending $3.7 million on indirectly aiding Walker’s campaign through advertising, bus tours, townhall rallies and similar support. Politifact Wisconsin ultimately rested on this number citing that the $11 million number said to have been leaked by DNC Chairwoman Debbie Wasserman Schultz should be viewed as conjecture. However, a closer look will show that at the very least Scott Walker walked away with an additional $1.3 million in support from Koch organized “donor summits”, and AFP spent $700,000 on a last-minute advertising blitz supporting the governor during the recall election. While hardly $11 million this $5.7 million figure has a paper trail leading directly back to Charles and David Koch, still, we believe the actual number is much higher and likely closer to Schultz’s original claim. Moreover, on June 7th 2012 CBS News posted a roundup indicating the total sum of contributions to Walker’s efforts by Charles, David, and AFP exceeded $10 million. Koch Industries should not be challenging us on the specific amount we cited in our talking point sheet, but instead should be doing their best to avoid using the 501(c)3 and 501(c)4 systems to play gymnastics with their campaign contributions. [KOCH] This is false. David Koch has not fought against expanded healthcare access. Rather, he has contributed hundreds of millions of dollars to fund medical research that has benefitted untold numbers afflicted with cancer. [SPARROW] AFP has a passionate web-based campaign they call “Hands off my Healthcare” (an indictment of “Obamacare”) that does very little to articulate their idea of what healthcare is or should be (other than a service that does not result in raising taxes and exists autonomously from government intervention.) To make things even more confusing, AFP invited Representative Paul Ryan to speak at their Washington DC “Hands off my Healthcare” rally this spring. Paul Ryan’s healthcare plan, should he become vice president, would consist of shedding $800 billion in federal spending on Medicaid over 10 years, subsequently limiting service to over 60 million Americans. Ryan has already supported a GOP plan to slash an additional $1.6 billion from the National Institutes of Health. It should be recognized that David Koch has donated over $200 million to cancer research centers at Memorial Sloan-Kettering and M.I.T. but only while bankrolling the members of the GOP leading the charge to slash-and-burn our Nation’s healthcare services, and while knowingly dumping hundreds of tons of cancer-causing Koch Industries petrochemicals into surrounding communities. [SPARROW] While “economic freedom” and “individual liberty” are floral terms, they do little to address the glaring fact that the influence of Koch industries on legislators seeks to roll-back environmental safeguards and social safety nets, and thus limit “individual liberties” by exposing people to trace elements that increase cancer rates, or by stripping ones “economic freedoms” by taking away their collective bargaining rights. [KOCH] Citizens United vs. the FEC was decided by the Supreme Court and is entirely distinct from the electoral campaign process. (Read about the media’s frequent mischaracterization of the Citizen’s United decision.) Koch has not advocated for or against the decision. We were not party to it and we follow all campaign finance laws regarding disclosure. It should be noted that the court’s decision applies to groups on both ends of the political spectrum, including labor unions. [SPARROW] Koch Industries is correct in stating that they are not a “party” to the court action “Citizens United vs. the FEC” but that does not mean that they did not use Koch Industries resources to affect the outcome of that decision. Koch has advocated for the decision and their efforts have been documented by public record. Ilya Shapiro and the lawyers at the Koch-founded CATO Institute filed an Amicus brief in support of Citizens United, while William H. Mellor and the lawyers at The Institute for Justice (a group founded and funded by Charles Koch) also filed an Amicus brief. The legal fees alone would have been in the millions as public record shows that at least 11 attorneys were working on the case at the behest of Koch Industries and their extension agencies. Moreover questions have been raised as to the potential influences Koch Industries has had on the Supreme Court Justices outside of the courtroom. One only needs to highlight Justices Thomas and Scalia’s attendance at Koch Industries donor summits to recognize that this incestuous relationship between the highest levels of our judicial branch and the businesses that stand to benefit most from rulings like Citizens United vs. FEC is a murky one and flirts with illegality. [KOCH] Koch is interested in ensuring that the debate on climate change and hydrocarbons arrives at an appropriate conclusion based on sound science, rather than preexisting political agendas. Like many others, we are concerned the proposals of some who believe in climate change would create tremendous economic hardships and have little or no effect on the climate. Instead, Koch encourages an honest and robust debate about these and other important issues.Koch makes a broad range of products including energy products that people need and does so responsibly. Koch companies have been recognized with more than 500 awards for safety, environmental excellence, community stewardship, innovation and customer service since President Obama took office. [SPARROW] To serve Koch’s interests as dealers in fossil fuels Charles Koch founded the CATO Institute. He then used Koch-backed foundation funding to contribute over $14 million to the Institute as start-up capital and then tapped the services of Patrick Michaels (a Senior Fellow at CATO and scientist employed by myriad clients in fossil fuel industries) to make media appearances dispelling climate change. Since 2009 Koch’s media strategy through CATO has had a significant impact on the way Americans view climate change, with polls showing a sharp decline in the percentage of Americans that see climate change as a true threat. Koch Industries has also gotten creative when defending their regressive environmental policies. In an attempt to co-opt the narrative surrounding the controversial Keystone XL Pipeline, Koch Industries affiliates partnered with America’s Building Trades Unions and adopted the language of Occupy Wall Street when they launched the website jobsforthe99.com This website targets those who oppose the pipeline as “Hollywood’s elite 1%” and is littered with web copy that echoes the phraseology of Occupy Wall Street. The awards received by Koch Industries for excellence in safety, stewardship, or innovation do nothing to negate the fact that Koch Industries have had 300 spills in 6 states. The aforementioned fine imposed on Koch Industries for dumping 91 metric tons of liquid benzene into a Texas estuary came only after Koch Industries plead guilty in court to lesser charges (this is further supported by Koch Industries Public Sector statements in reply to talking point #7 below) The full text of the DOJ’s 2000 indictment announcement can be read here. Surprisingly, Koch Industries use of this reply to talk about climate science, rather than responding to our allegations of 300 spills speaks volumes to Koch Industries Public Sector’s inability to respond to the allegations at hand and should read as an admission of guilt. [KOCH] Koch has been a member of ALEC which has existed for almost 40 years and works with Democrats and Republicans. While Stand Your Ground Laws have enjoyed bipartisan support–with many prominent Democratic governors signing them into law in Arizona, Michigan, West Virginia, and other states– neither Koch nor ALEC had anything to do with Florida’s law. As we have explained, any claim that Koch is in any way associated with the Florida law or the tragic death of Trayvon Martin is despicable and maliciously false. Indeed, even MSNBC was forced to admit it was wrong to make such assertions about Koch. [SPARROW] ALEC thrives on secrecy. Corporations make “donations” to ALEC so that the organization can draft model legislation reflecting their corporate interests, and lawmakers introduce these bills across the country. All the while, the public is kept in the dark about how corporations drafted these bills, and which politicians are ALEC members. Koch’s circuitous response is an example of this. The corporation has supported ALEC for 40 years, as it admits, yet Koch would rather keep the public in the dark about how it is helped draft model legislation. [KOCH] This claim is based on a deeply flawed article in Bloomberg Markets Magazine that relied heavily on unreliable sources. You can read one of the many critiques of the Bloomberg piece here. In November 1995, Koch Petroleum Group made a voluntary disclosure to the government related to its reporting of wastewater monitoring tests. After making this voluntary disclosure, Koch Industries, Koch Petroleum Group and four individuals were prosecuted by the Department of Justice for alleged violations of Clean Air Act provisions related to benzene. This was an overreach by the federal government. The 97-count complaint was resolved almost six years later with Koch Petroleum Group pleading guilty in April 2001 to a single count related to the wastewater reporting it had voluntarily disclosed in November 1995. The charges against the four were dropped and they were required to agree not to sue the federal government for malicious prosecution as part of the settlement. [SPARROW] While this long-winded response from Koch Industries may confuse a reader not familiar with legalese, a quick look at the response itself shows an admission of guilt. The disclosure mentioned above was required by law, thus when Koch Industries said they were “voluntarily disclosing” they were merely adhering to the law. What is not accounted for was the levels of liquid benzine (which exceeded 9x the permissible amount allowed in the plants liquid refuse.) When an independent assessment was made the excessive levels this assessment did not match Koch’s filings. This is why they lobbied to have the 97 count indictment reduced to a failure to accurately disclose. Koch Industries agreement to pay one of the largest fines ever imposed upon a polluter should also speak volumes as to their guilt. Lastly, as a part of all plea bargains defendants are required to agree not to sue the prosecution post-settlement. Koch likely included this standard legal boiler-plate as a means to confuse readers. [KOCH] Neither Charles Koch nor David Koch has ever made such a pledge. We challenge those making this assertion to provide factual evidence of this false claim. [SPARROW] Koch’s 2012 winter summit in Indian Wells, California raised $150 million alone. Also, while addressing the group at Koch’s June 2011 “secret” seminar in Vail, Colorado, Charles Koch acknowledged the attendance of Texas Governor (and then White House Hopeful) Rick Perry and encouraged those in the room to donate millions to their shared fight against the Obama administration. Charles Koch said he would not rest until president Obama’s challenger had 10x his 2008 campaign war chest. Charles Koch went on to read out loud the names of 32 individuals who have taken lead by donating more than $1,000,000 to the group’s efforts. [KOCH] Another sweeping and unsubstantiated statement that is false and absurd. [SPARROW] Both The American Energy Alliance (AEA) and the Institute for Energy Research (IER) are funded by David & Charles Koch. AEA is the political arm of the IER and is responsible for the aforementioned ad content as well as the $3.6 million spent on placement of these inflammatory ads tethering the Obama administration to high gasoline prices and attacking the administration for blocking the Keystone XL pipeline. While AEA & IER use their non-profit framework to shelter their connection to Koch Industries, they cannot hide the fact that their president, Thomas J. Pyle has served for many years as a lobbyist for Koch Industries. [KOCH] We believe that the American people can make decisions about the fate of the nation for themselves and that their vote cannot be bought or manipulated by advertising or clever slogans. Regardless of the clarity of their concerns, we respect the protestors’ rights to free speech and to peaceably assemble. These rights apply not only to the protestors, but to those who are hosting and attending the fundraiser. [SPARROW] Likewise, “we believe that the American people can make decisions about the fate of the nation for themselves and that their vote cannot be bought or manipulated by advertising or clever slogans.” It is for this very reason why it is imperative for the American public to challenge the corrupt influence that Koch Industries and their extension political action groups have on our democracy. We need only take a look at some of the attendees of David Koch’s July 8th fundraiser in Southampton to understand that should Mitt Romney become president, these major campaign contributors will cash in on their pledges. 1.) William Koch, Runs Oxbow Carbon, worth $4 Billion, Donation $2 Million to Romney’s Super PAC. What He Wants: Decreased environmental regulation from the EPA and other government agencies. 2.) Harold Simmons, an owner of 5 exotic metal & chemical trading companies has a personal worth $9.8 Billion. Simmons donated $800,000 to Romney and has a total giving $16.7 Million. What He Wants: Harold wants to store radioactive waste in Texas through his company Valhi, Inc. 3.) Bob Perry, Owner of Perry Homes, Worth $600 Million, Donation $4 Million to Romney’s Super PAC. What He Wants: Tort reform to limit jury awards on homebuilders who do shoddy work. 4.) Jim Davis, Chairman New Balance Shoes, worth $1.8 Billion, Donation $1 Million to Romney’s Super PAC. What He Wants: A lucrative Defense contract. 5.) Richard & Bill Marriott, Heir to Marriott Hotel Fortune, Worth $3.3 Billion, Donation $2 Million to Restore Our Future. 7.) Edward Conard, Ex Managing Director of Bain Capital, Worth $250 Million, Donation $1 Million to Restore Our Future. What He Wants: Extended and expanded tax breaks. 8.) Frank VanderSloot, CEO Melaeuca, Inc., Worth $1 Billion, Donation $1 Million to Romney’s Super PAC. What He Wants: Less consumer protections. 9.) Steven Lund, Vice Chairman Nu Skin Enterprises, worth $31.9 Million, Donation $2 Million to Restore Our Future. What He Wants: Less restrictions on marketing and advertising. 10.) Julian Robertson Jr., Hedge Fund Titan, worth $2.5 Billion, Donation $1.25 Million to Restore Our Future. 11.) John Paulson, Hedge Fund Titan, worth $12.5 Billion, Donation $1 Million to Romney’s Super PAC. What He Wants: Increased deregulation of capital markets. 12.) Paul Singer, Hedge Fund Titan, Worth $1 Billion, Donation $1 Million to Romney’s Super PAC. What He Wants: Singer needs Fed backing in his lawsuit to collect $2 Billion from Argentina. 13.) Robert Mercer, CEO Renaissance Technologies, made $125 Million in 2011 alone, Donation $ 1 Million to Romney’s Super PAC. What He Wants: To squelch a proposed tax on stock options. 14.) Kenneth Griffin, CEO Citadel LLC, worth $3 Billion, Donation $1 Million to Restore our Future. What He Wants: To end Volcker Rule on Dodd-Frank Wall St excesses. 15.) L. Francis Rooney III, CEO Rooney Holdings, worth $40 Million, Donation $1 Million to Restore our Future. 16.) Steven Webster, CEO Avista Capital, worth $4 Billion, Donation $1 Million to Romney’s Super PAC. What He Wants: He was the owner of the Deep Sea Horizon, responsible for the worst environmental disaster in our Nation’s history. Tagged blackwater, david koch, koch brothers, koch industries, mitt romney, occupy, rnc2012, robert tappan. On July 11, 2012 the New York Post ran a 37 paragraph story on a tenuous connection between DNA found on a sequence of chain left behind at a direct action and DNA found at a 2004 crime scene where a Juilliard student was found murdered. Side-stepping both logic and decency toward the victim’s family the Post disregarded the fact that as many as 8,000 New Yorkers came near or in contact with the chain as it affixed an MTA emergency door open (part of a fee-strike labor action in solidarity with NYC transit workers) and immediately planted the story on the tabloid’s front page along with a sensational headline that read “OWS Murder Link”. In the 48 hours after their rush, a flood of speculative stories were published, undoubtably opening up old wounds for the family and loved ones of the murder victim. Within 2 days of the story breaking an anonymous official with the NYPD stepped forward to say that the DNA found at both the direct action and the 2004 crime scene were in fact from the skin cells of an NYPD lab official who came into contact with evidence at both locations. Instead of posting a lengthy retraction and public apology for misleading the city, the Post ran an article claiming that the DNA evidence had been “contaminated”. A similar article appeared in the Daily News under the headline “Lab Rats” (alluding to the lab official’s breach of the NYPD’s “blue wall of science” by coming clean with the truth). Larry Celona and Jamie Schram were the reporters at the New York Post most directly responsible for breaking this “story,” both work a police beat and both regularly liaise with the NYPD. This incident and the subsequent lack of a proper redaction and apology go beyond Larry and Jamie and speak to a pattern at the Post of vilifying and demonizing groups that speak truth to power in New York City, specifically those who have challenged the NYPD (like Anti Stop-and-Frisk campaigns & Occupy Wall Street). The Post had attempted for nearly 10 months to try and frame the largely non-violent Occupy movement as anything but, and quickly jumped on this unverified DNA connection to a horrible tragedy as a opportunity to frame that narrative. The fact that Larry and Jamie have so much contact with the NYPD further muddies the journalistic waters as this originated with the NYPD and was later handed to Celona & Schram. Despite some clarifications (certainly not a clarification on the tabloid’s front page) one has to wonder what activists can do to hold institutions like the Post accountable for their misdeeds? We as publicists at the Sparrow Project specialize in being a middle agency between activists and the press. We are only able to provide such agency on account of our contacts at mainstream media outlets. Since our foundation is built upon trust with our contacts, it is almost always counter-intuitive to publish our contacts …except today. We believe that there is no hope for the New York Post as a media outlet, and we can easily justify burning our bridges with the tabloid in hopes to achieve any element of justice. Listed below is the personal contact information for not only Larry Celona and Jamie Schram. We share this information with you in hopes to make right an infinite amount of wrongs perpetrated by the Post and we implore of you to use this information in a responsible manner to address your complaints and not to intimidate or threaten those who you communicate with. Tagged libel, mta, murder, new york post, nypd, occupy, occupy wall street, ows.